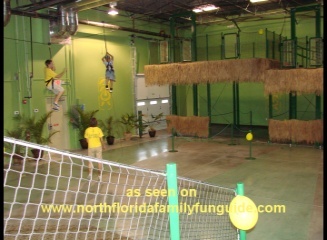 Opened in January of 2009, Jungle Quest is an interesting blend of physical challenges including 3 Ziplines, a giant Rockwall, and a Rope Bridge and slides. This experience is geared for children ages 5-12. Parents who accompany their children can also participate. Children younger than 5 years old can play on the climbing rope bridges and slides, and also a climbing pyramid slide enclosed in a gate with soft flooring for the very little ones. They have 2 popular birthday party rooms available. Kids love these kinds of physical challenges. It helps build confidence and self-esteem when they accomplish something this challenging. It teaches self confidence, responsibility, problem solving and teamwork. This would be a perfect venue for a youth group event, or a team building corporate event, or a summer camp event up to 125 people. This place gets packed on weekends, and mornings, so plan accordingly.It is so new it's not even on Google Maps yet, but once you know where it is, though it's really easy to locate. Just go North on 17 (Roosevelt)until you see the Yorktown intersection for NAS Jax. The Blue Angel airplane is on the corner. Turn LEFT, away from Yorktown and across the railroad tracks. Follow the street as it goes to the left, and turn right on Sub Chaser Circle! Come see this unique experience!